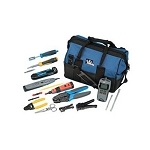 The Black Box VoIP Tool Kit supplies all the essential tools and devices necessary for installing, servicing, and terminating connections for Voice over Internet Protocol call centers. 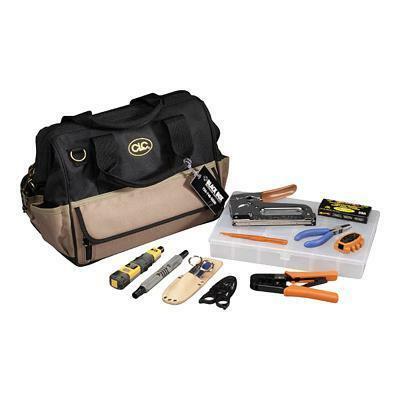 Inside this VoIP kit is a spectrum of tools from cable splicers to staple guns, all fitting inside a durable, 14-pocket, nylon tote bag. A wrench/stripper is great for stripping PVC insulation cable jackets, a crimping tool is of course great for making the connection, a pen-size pocket probe aids in pulling wires and clearing dust from small spaces, a punch down tool is great for all sorts of telephony applications, and the staple gun can fasten low-voltage wiring. As you can see, absolutely everything one would need for installing voice over internet protocol can be found in this BlackBox VoIP Tool Kit.